With the rack-mountable Sensaphone IMS-1000 Single Room Monitoring Solution; a built-in web server lets users view status, make changes, and review history while the included relay output can switch local devices on/off based on alarm activity. Receive alarm notifications through e-mail, text messaging, and SNMP. The available phone-line option adds voice alerts and call-in status. Each sensor input features LEDs to indicate status while alarm LEDs show when power, IP, or battery alarms have been triggered. The Infrastructure Monitoring System (IMS-1000) from Sensaphone is the perfect solution to oversee critical environmental conditions in single locations. The system is designed to be a comprehensive method of ensuring 100% up-time of your computer systems. By monitoring all aspects of your computer room, including environmental conditions and network equipment, the system will keep you informed of the status of your infrastructure. Monitored conditions can include temperature levels, humidity levels, line voltage, leak detection, server response, UPS systems, and more. The system allows appropriate personnel to be notified immediately of any detected problems. Notification can occur via voice telephone call, pager, e-mail, or fax. An internal battery backup system insures that the unit will continue to run if main power fails. The system also includes the ability to remotely perform diagnostic tests via Touch-Tone commands or e-mail. Capabilities: Connect as many as eight sensors to monitor a variety of conditions, including a -85°C temperature sensor ideal for cold-storage applications. Built-in power-failure and IP-device monitoring help ensure proper functioning of devices on your network. 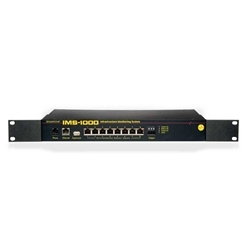 Features: Access programming through the IMS-1000 SNMP Agent. This built-in web server allows you to view status, make program changes, and review data history. An included relay output can switch local devices on/off based on alarm activity. Alerts: Receive alarm notifications through e-mail, text messaging, and SNMP traps. An available phone-line option adds customizable voice alerts and also give users the option to call-in for remote status updates.